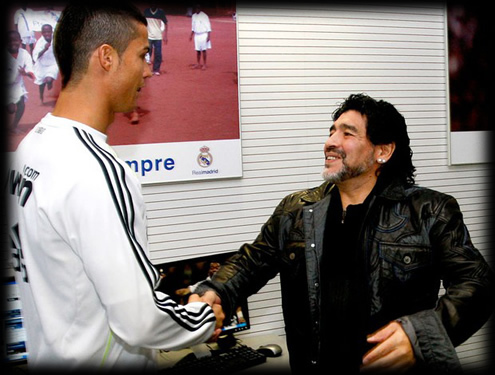 24.02.2011 » Maradona: "I can see Cristiano Ronaldo and Aguero playing together"
Diego Armando Maradona imagines the powerful partnership that Cristiano Ronaldo and Sergio "Kun" Aguero would make in Real Madrid. The argentinian legend also made a very interesting comparison between Messi and Kun Aguero. Diego Armando Maragona spoke to spanish newspaper "Marca", about the potential signing of Sergio "Kun" Agüero for Real Madrid, in the next season. The argentinian legend previews a partnership that could mark an era: Cristiano Ronaldo and Kun Aguero. Maradona: "I can see Kun Aguero in Real Madrid, with Cristiano Ronaldo by his side, giving a lot of troubles to defenders like Piqué and Puyol. Both Ronaldo and Aguero are true fighters. I can say I've played against strong defenders as Mozer, Júlio César or Augenthaler. They would spread fear to any player, but Cristiano Ronaldo and Aguero are really fantastic." Maradona also made a curious suggestion in order to compare the real value of Kun Aguero and Lionel Messi. The argentinian wonders how it would be, if Messi would switch to Atletico Madrid and Aguero to Barcelona, regarding the difference people usually see between these two players. Maradona: "If they did such a switch... What would people think of both by then? That would be a good way to compare the two players in a more fair way." You can watch Deportivo de La Coruña vs Real Madrid this Saturday, here on www.ronaldo7.net. Cristiano Ronaldo was doubtful after suffering a small injury in the match against Lyon, but should be fit to start the match.